As you begin your search for a new compact crossover SUV, you’ll find that there are many vehicles to choose from in the highly popular automotive segment. If you are looking for one that can give you the versatility and capability you need while also offering you the technology features and comfort options you desire, the Chevy Trax is a perfect choice. Keep reading to learn more about the many standard features and available options you can get in an affordable used Chevy Trax compact crossover SUV. On the inside of the versatile Chevy Trax crossover SUV, you’ll find an impressive number of standard and available technology features to choose from. 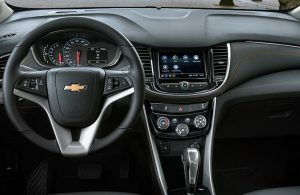 The lengthy list of high-tech features offered in the many trim levels of the Chevy Trax lineup include auto industry favorites like Apple CarPlay™, Android Auto™, Bluetooth®, Chevy’s MyLink™ infotainment system, a 7-inch touchscreen display, satellite radio, two USB ports, a 4G LTE Wi-Fi® hotspot, OnStar® communications, a rearview camera, a Bose® premium audio system with six speakers, and much more. When it comes to affordable interior comfort in a used compact crossover SUV, the Chevy Trax is at the top of the list of best choices. The Chevy Trax offers an impressive number of comfort features and options to pick from that include driver and passenger favorites like simulated leather upholstery, heated front seats, a sunroof, remote engine start, cruise control, air-conditioning, keyless entry, a six-way power adjustable driver’s seat, and many others that will help every occupant stay comfortable while on the road. This entry was posted on Friday, February 1st, 2019 at 8:00 am	and is filed under Chevy Trax. You can follow any responses to this entry through the RSS 2.0 feed. You can skip to the end and leave a response. Pinging is currently not allowed.